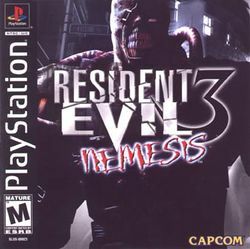 Resident Evil 3: Nemesis is the sequel to the largely popular Resident Evil 2. The game was released on September 22, 1999 in Japan, and continues the story of Raccoon City's virus outbreak, but focuses on Jill Valentine (one of the protagonists from Resident Evil) and her escape from the city. This title is referred to as a "midquel", since the first half of the game occurs 24 hours prior to Resident Evil 2 and the second half taking place the day after. It features a memorable enemy named Nemesis, who stalks the player through the entire game and is encountered either in boss fights, live selections or at random; defeating him is very difficult, but he'll drop a handy reward (gun parts, first aid containers, or even weapons) for players who do. On top of this, the game adds a live selection mode, in which they're prompted to choose between one of two possible actions (a wrong decision can lead to a boss fight or even death). Another feature found in Resident Evil 3 is the inclusion of an ammo-making system, where players can combine various types of gunpowder and ammo in order to make more ammo (or sometimes enhanced ammo). This title also introduces the quick-turn feature, which allows the player to make a hasty retreat when threatened; dodging is also introduced, giving the player an advantage over enemies and a larger amount of strategies to use when fighting them.